The sun has come out, the chickens roaming, the flowers blooming all in one cushion. Beautifully done appliqués with rolled printed edging all around. This cushion was designed to impress anyone and of course, the gardener. Hold on to happiness. 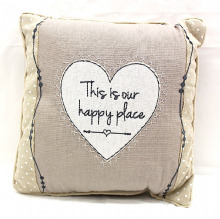 Keep this nice little cushion nearby and be reminded. In cream and beige with contrasting black sewn letters inside a heart . This cushion is elegant as it is stylish, worthy to sit anywhere in the home. 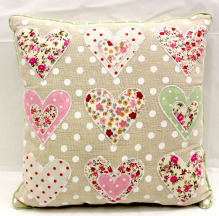 Nine hearts in one cushion, each different from the other. Flowers and polka dots, a lively mix that all come together as one design. Want a rather different cushion? This is it . Umbrellas and rain boots appliqués on the front side and dainty printed flowers on the back side. "You make me smile when skies are grey" such a sweet gift. Tell someone, how much he/she is cherished. 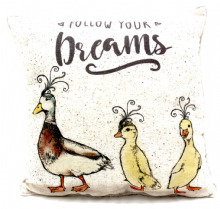 "Follow your dreams" a delightful interpretation by the artist. A duck family with one little one diverging. This is an ideal gift for dreamers - who dream big or who dream small. This vase says it all. Bright, light and perfectly sized, it will sit nicely by a window. Filled will blossoms, serves as a pretty reminder of what make life tick. 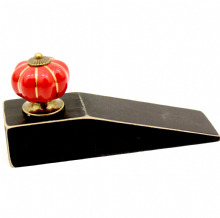 Lighthouse made from red stone, smooth, glossy and small, would perfectly fit as decor in any shelf or desk. A door stop with a nice reminder each time the door is opened or closed. 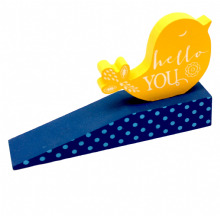 Painted wood with animal decor, a door stop both useful and lovable. Not all door stops are created equal. This wooden door stop topped with a vintage knob is stylish and would be a useful and welcome accessory to any home. "...don't have a wooden heart..." ? but this door stop does. Roughly carved in deep red the heart is the perfect combination for the antique stained wood door stopper. 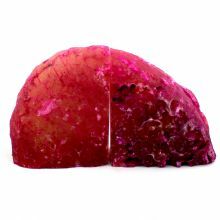 So eye catching this fuchsia pink volcanic crystal filled rock, ancient and mysterious, definitely not just another bookends. This slice of purple ancient volcanic rock, crystal filled colour bands, would be the ultimate display in any collector's shelf. Bookends in carved hard hard wood with natural finish. Simple, classic and durable. An gift to enjoy and cherish for many years. Ancient volcanic rock filled with crystals giving it bands of colours displayed when cut. No two agates are ever the same and as the myth goes, it has calming powers too. Starfish in beautiful marble, truly elegant and stunning. 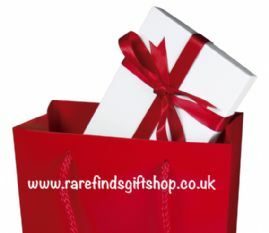 If you want something extra special to give or to own for the home, this would be it. Little starfish carved from fossil stone, each is unique, no two are the same, this is one-of-a-kind. A gift for the sea lover.